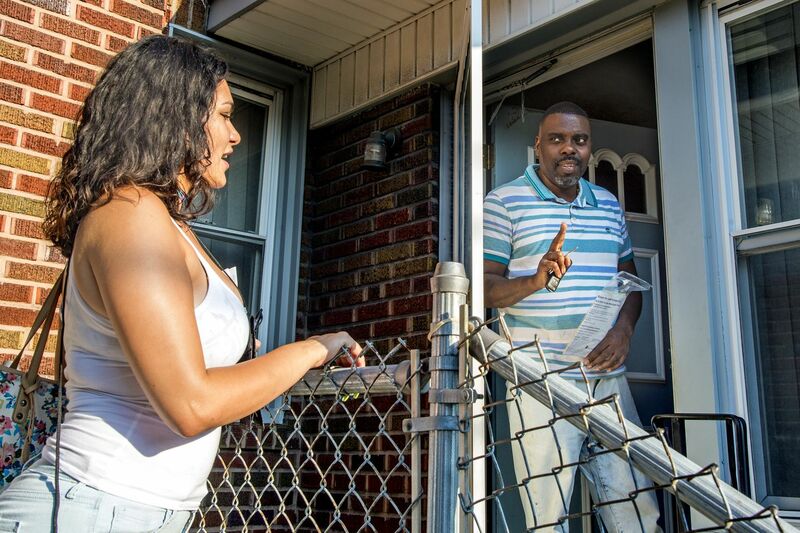 Keinalyse Medina (left), a canvasser with Community Marketing Concepts, a marketing consultant group contracted by the city's Department of Revenue, talks with Kevin Rozenblad (right) as she goes door-to-door in Ogontz. Kevin Rozenblad came to the door of his two-story brick rowhouse in West Oak Lane last week and found a young woman eager to greet him with a bag of fliers. He opened the door a crack, looking skeptical. The woman had been sent by the city's Revenue Department, but she wasn't there to collect — she was trying to help him save money on his property taxes. Handing him a plastic bag with a yellow brochure inside, Keinalyse Medina told Rozenblad that if he signed up for the city's homestead exemption for owner-occupied homes, he could save $560 in property taxes next year. That would represent about a 28 percent discount on his 2019 tax bill. Rozenblad was happy that Medina came. "Absolutely, yes, I'm more aware," he said in the doorway of his house on the 7100 block of North 19th Street, where most homes are worth $130,000 to $150,000, according to the city's assigned market values. In Philadelphia, rapidly developing neighborhoods and increasing tax bills have prompted concerns that homeowners could be displaced. Tax foreclosure filings have skyrocketed 1,200 percent since 2010, though only about 350 homes — a fraction of the total filings sold at sheriff's sale last year — were owner-occupied. The tax-collection blitz followed years of more lackadaisical enforcement, said Cat Martin, lawyer for Community Legal Services. "We need the city services well-funded. There's no issue with that," Martin said. "But when you have people who are very low-income, who for a long time relied on the idea that the city wasn't collecting taxes, you need some programs to ensure people aren't losing their homes." City officials are making a push to ensure that residents know about the rebates, through the door-to-door outreach program organized by the Revenue Department. Street teams have reached 983 homeowners in person and left materials at about 6,000 other homes in six neighborhoods: West Oak Lane, Cobbs Creek, Lower Moyamensing, Feltonville, Kensington, and Harrowgate. The city said it targeted those neighborhoods because all of them experienced changes in property assessment values, and had higher rates of tax delinquency and lower rates of participation in assistance programs. The city is paying Community Marketing Concepts, a marketing consultant group, $32,000 for the outreach efforts, which includes the cost of printing brochures and paying canvassers $12.20 an hour to knock on doors throughout July and August. The city's outreach teams are touting three programs: the homestead exemption, available to all owner-occupied residences; a senior tax freeze for low-income seniors; and an owner-occupied payment plan, to prevent those who have fallen behind from foreclosure. Eddie Howard, a canvasser with Community Marketing Concepts, a marketing consultant group contracted by the city’s Department of Revenue, goes door-to-door in West Oak Lane, leaving information packets and talking to homeowners about tax relief programs. Overall, about 79 percent of eligible homeowners receive some kind of property tax assistance from the city, officials said. Rates are almost that high (between 73 percent and 76 percent) for those enrolled in the homestead program, the longtime-owner-occupied property tax abatement known as LOOP, and the Owner-Occupied Payment Agreement plans. The senior tax freeze has the lowest rate of enrollment. Only 56 percent of those eligible, 16,504, have signed up for the program. The deadline to apply for the homestead exemption and the senior tax freeze is Sept. 13. If all eligible residents enrolled, city officials said the relief programs would cost an estimated $35 million in lost tax revenue. Reaching seniors is particularly important, said Emily Dowdall, who has studied property tax relief programs through her work at the Reinvestment Fund. "While a new homeowner may get information through a Realtor or a mortgage company, a senior citizen who may have lived in their homes for a long time might not hear about those programs," she said. Dowdall noted that relief programs are particularly needed in Pennsylvania, where the state uniformity clause prevents municipalities from taxing residential and commercial property at different rates. Even with an organized canvasing team, connecting with homeowners can be difficult. On a recent Thursday evening in West Oak Lane, few residents came to the door, especially after hearing that their visitors were from the Revenue Department. Some identified themselves as renters or family members of the homeowner. Others took the visit as an opportunity to air their grievances. John Sullivan of Elston Street told canvassers that he already had the homestead exemption. But his assessment has increased, and he wanted to know why. "You're not telling me what changed on my block, what changed in my neighborhood," Sullivan said. Information packet for homeowners about tax relief programs delivered by canvassers with Community Marketing Concepts, a marketing consultant group contracted by the city’s Department of Revenue, as they go door-to-door in Ogontz on Aug. 23. Continued property assessment increases seem inevitable, he said, and "that's the scary part of it, because you're telling me my property taxes will go up, but I want to know by how much. I want to know why." The outreach reflects a citywide push to combat property-tax foreclosures. Last year, City Council passed the Property Tax Foreclosure Prevention Program, aimed to help residents stay in their homes. That program has not yet gotten on its feet but should start in September, Paul Chrystie, a spokesman for the Division of Housing and Community Development, said. The $207,500 program will fund hotline support and about 80 housing counselors who will work with homeowners, he said. In October, the city will again go door-to-door to known tax-delinquent seniors. Chrystie said the outreach will include helping homeowners sort out tangled titles in order to get into the assistance programs. The courts also offer mediation between tax collectors and taxpayers, similar to the Mortgage Foreclosure Prevention Program, at hearings every Tuesday and every other Wednesday in City Hall. Community Legal Services is doing its own direct outreach in Sharswood, Brewerytown, Strawberry Mansion, and Point Breeze, all neighborhoods undergoing rapid development. "The idea is to pour as many resources into these neighborhoods to try to completely eliminate property-tax foreclosures and delinquency among seniors there," said Martin, of CLS. Martin said she's happy to see the city getting the word out in person, given the high volume of mailers people get and the fact that having multiple assistance programs can get confusing. Take Rozenblad. He lit up at the prospect of saving money through the homestead program. Actually, property records show his home already has the exemption. "It can be very confusing to people," Martin said. "I've seen people get homestead and think that their tax debt is forgiven. Then they wind up sinking deeper into debt, because they think the problem has been taken care of." Information on Philadelphia's programs is available on the city website. Philadelphia residents in foreclosure or behind on property tax payments can call the Save Your Home Philly Hotline, operated by Philadelphia Legal Assistance, at 215-334-4663.